This week has been a very exciting one for me – I’ve been able to share the lovely places, people and experiences of this island with some wonderful artists from California. We’ve explored some gorgeous locations armed with sketch books, cameras and paints. We’ve walked for miles, enjoyed some fantastic meals, great wine, and the friendly hospitality of the islanders. Somewhere in there the group has produced some beautiful art. Today is our last full day and everyone is working on a set of small paintings to share with the rest of the group, so we all have a memory of the others as we leave. 6:30am-ish: Orientation – we start the day with an early morning walk around Vrboska’s harbour and back alleys (for about an hour). This is the absolute best time to take photos, as the rising sun catches the old stone buildings and the boats, and the reflections are perfect. Discover where everything is, and buy pastries at one of the bakeries for breakfast. 9:30am Discussion of projects. At our home base we have a shady painting area, and you can also paint & sketch on the waterfront with Konoba Lem as a base. 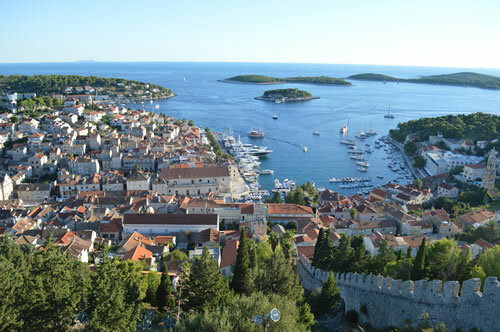 We’ll go inside the famous church-fortress of Sv Marija and take in the view from the roof, tour the Fisherman’s Museum, and look at traditional fishing boats. 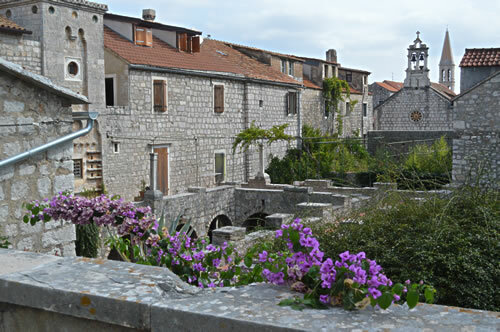 9:00am Drive to Stari Grad, where we visit the fortified Monastery, which has a pretty cloister and a small museum. Paint at Tvrdalj (the 16th century summer residence of the Croatian poet Petar Hektorovic with a fish pool and garden) in the morning and visit Biankini palace, now the museum of Stari Grad. Visit to greek and roman ruins, early Christian church with baptistry. Lunch somewhere in Stari Grad – lots of lovely little restaurants tucked away in those ancient streets, or across the harbour for the views. After lunch, visit the Stari Grad agricultural plain – visit Kupinovik (remains of a roman farmhouse), Agro-turizam Pharos (lovely shaded area surrounded by olive groves with hens, goats, donkeys and horses, and wine-tasting available), and finally we’ll look at a rather fine specimen of a Trim, the traditional dry-stone field shelter. 9:45am – Drive to Marinka’s art studio in nearby Dol. Artists will spend the day painting and discussing art with Marinka. She is a Slovenian artist who has a lovely old farmyard complex adapted as a creative space where she paints in watercolours and oils, and exhibits her art. Take a picnic lunch or salads to share. In the late afternoon, we’ll have dinner at Marinka’s with everyone invited. 9:30am Drive up to the top of the island to the double village of Velo Grablje and Malo Grablje. We’ll look around Velo Grablje, then either drive down to Malo Grablje, or you can follow the old path down the valley if you want a walk. 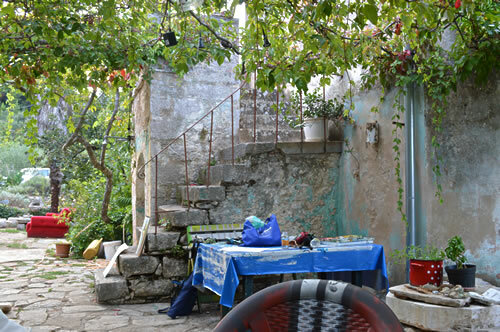 We’ll spend the morning painting around the deserted village of Malo Grablje, tucked away in a quiet rocky canyon. Around 1pm, we’ll have lunch at the Stori Komin – the village konoba is still open for business! On the way home, or you can walk down, we can visit the seaside village of Milna to complete the story. This is where all the villagers went! 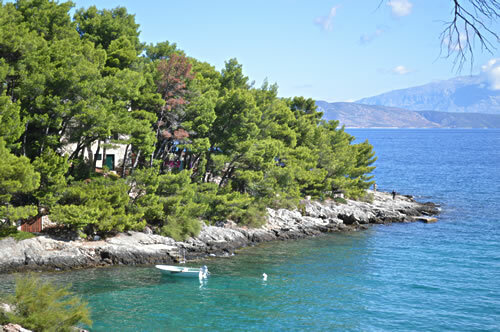 10am Setting out from Vrboska, walk round the Glavice headland coastal trail. Paint on the beach, and swim. The north shore is more rugged and rocky, while the south shore is sheltered and shady. Should not be busy at this time in the season, but the water will be beautiful and warm. There is a bar for cold drinks and ice cream, and toilets. 5pm We are invited to a BBQ/grill at Lui and Dragana’s field. We will go early to sketch/paint there. Hanibal Lucic garden 10am to ? Morning free – catch up on paintings, blogs, emails, etc! Late afternoon – taxi to Pitve. 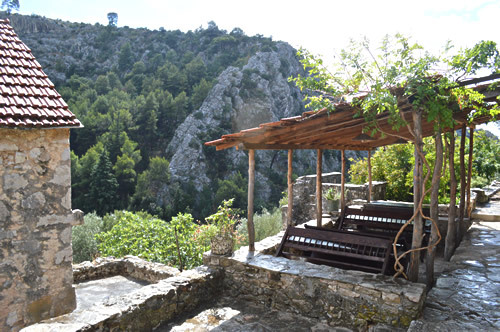 Vineyards, olive groves and views. Final evening dinner at Dvor Duboković in Pitve, with a traditional Dalmatian peka and spectacular views over the sea as the sun sets. We may even get a local klapa group to entertain us.